For those of you wondering what all the fuss is about, I should explain that The Door (of Shame, Blame and Brilliance) is located in our newsroom and is home to a collection of the best and worst examples of newspaper journalism, clipped and pasted to it by reporters here at Siuslaw News since the 1970s — back when truth was defined in black and white, yet the line between nose hair and mustaches was a little grey. 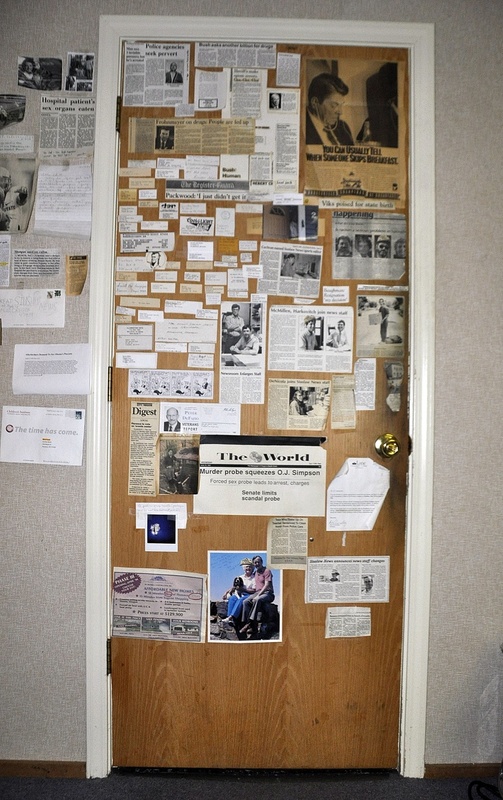 For more than 40 years, The Door has served as a sentinel, preserving journalistic history while, simultaneously, preserving breathable air serving as the door to our commode. As we do each Tuesday, we will now highlight a clipping, but not before keeping a tradition established decades ago by reporters in this very office. And you’ll just have to trust me on that. reports are good to have. Today I will shout it from the mountain top or 100 feet of elevation, the most we can find here in Illinois. What they failed to mention is that there was only one letter on each page. And I’m sure the next report will include a report on that report. Do not resort to deporting the report retorter. Also, 668 pages in 18 months? It would take them at least a decade to get through Game of Thrones. Tisk Tisk! Once again, after audibly chanting in my best monotone, I can report that I love this.